1972, Louisiana; 1973, U.S. District Court Eastern District of Louisiana, U.S. District Court Middle District of Louisiana, U.S.
Mr. Saporito is one of the leading products liability, warranty/redhibition and insurance defense practitioners in the United States, with over 40 years of experience in every facet of litigation in these areas. 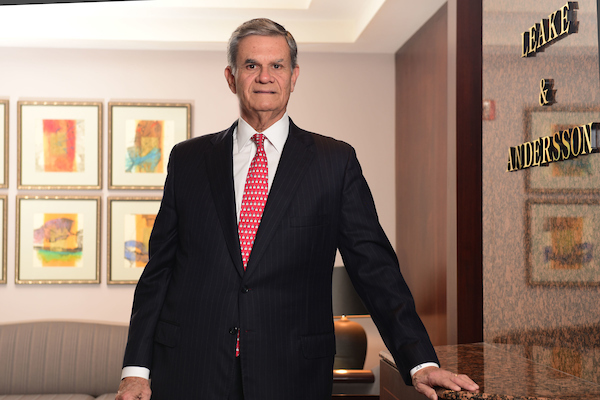 Mr. Saporito is local and regional counsel for several of the largest product manufacturers and insurance firms in the world, serving as lead counsel in state and federal courts throughout the Gulf South region. Highlights of his experience in these areas include representation of clients in nationally publicized cases such as the FEMA Trailer Formaldehyde multi-district litigation (appointed to Defense Steering Committee), Attorney General tobacco litigation, Airbag Class Action, Post-Collision Fuel Fed Fire cases, maritime claims arising out of the allision between the M/V Bright Field and the New Orleans Riverwalk, the mass casualty arising out of the 1999 Mother’s Day bus crash in New Orleans, LA, and the Chinese Drywall Mass Tort Litigation. Mr. Saporito is a frequent speaker with both the Louisiana State Bar Association and Tulane University continuing legal education programs on products liability and insurance defense issues, and has served as a faculty member of the International Association of Defense Counsel Trial Academy. He is the co-author of an instructional paper titled “Discovery and Cross Examination of Plaintiff’s Liability Expert,” which was presented at the International Association of Defense Counsel Trial Academy. He is the author or co-author of many other papers delivered at the LA State Bar Association and various conferences to industries relative to product liability and warnings. Mr. Saporito also advises and represents clients in the Firm’s international trade and business practice. Mr. Saporito has experience in a variety of international business areas, including negotiating and drafting foundational documents for new cross-border business ventures and international trade transactions. Mr. Saporito also advises the Firm’s domestic and international clients on overseas investment and business opportunities, with a particular emphasis on risk avoidance and assessment strategies and international arbitration issues.